As promised, Jordan Brand made another noise this weekend with the release of the new colourway of the Air Jordan 3 Retro, which has been well-accepted in the market since making its comeback this year. The retro edition of one of the well-loved models from the Air Jordan numbered series was released in Stealth/Varsity Red – Light Graphite – Black colourway last Saturday. 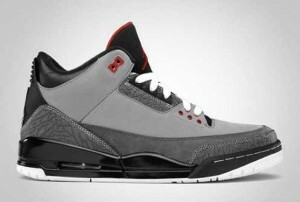 Just like its earlier editions, the shoe looks very simple but its simplicity makes it more attractive to the consumers. This “stealth” edition of the Air Jordan 3 Retro is definitely a must-buy this month!